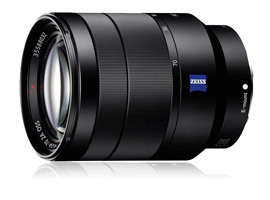 Sony Zeiss Vario-Tessar T* FE 24-70mm F4 ZA OSS lens review: Good value? Sony’s full-frame mirrorless 36-Mpix A7R and 24-Mpix A7 models have the potential for high image quality but that’s only half of the imaging chain – they require high-grade lenses to deliver on that promise. The bodies are of course much smaller than a full-frame DSLR and Sony has designed the lenses to match. As a stabilized model, the mid-range, moderate speed Zeiss Vario-Tessar T* 24-70mm f4 ZA OSS is relatively compact at 2.87 x 3.72″ (73 x 94.5 mm) but at 15.17 oz (430 g) it’s a fair weight. With a $1,199 price tag it’s squarely aimed at enthusiasts and has a complex optical formula consisting of a total of 12 elements arranged in 10 groups and features an internal zoom mechanism and a minimum focusing distance of 1.31′ (40 cm). Of those 12 elements, 5 are aspherical to minimize various aberrations and maintain the lens’ compact dimensions, while a single low dispersion glass element is used to further reduce chromatic aberrations. It employs a linear ‘stepper’ motor for silent AF – useful for video capture and the all-metal construction has a dust and moisture resistant design. Naturally as a FE-mount model it’s also compatible with the firm’s earlier APS-C format NEX models (and current Alpha mirrorless models) where it’s the equivalent to a 35-105mm. The lens is available now, albeit in limited quantities. 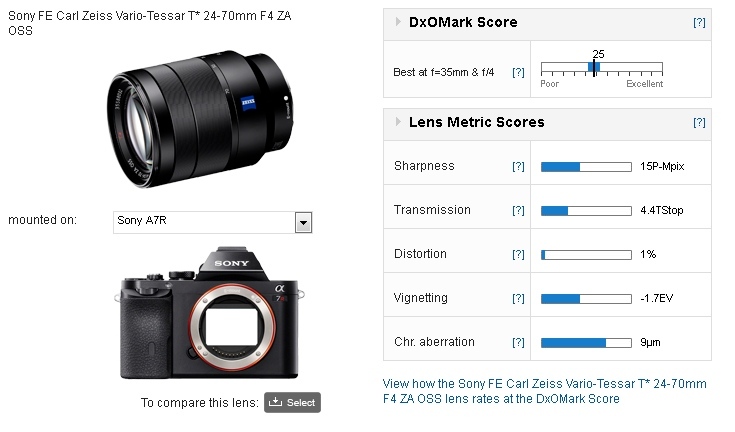 The new Zeiss Vario-Tessar 24-70mm f4 achieves a DxOMark lens score of 25 points – a good score for a mid-range full-frame zoom with a moderate-speed maximum aperture. Sharpness is quite good throughout the zoom range (though at 15P-Mpix the perceptual sharpness is still only less than half the potential of the sensor). Uniformity across the field is well above average, though that’s more so at mid-focal lengths wide-open than the extremes though as you might expect it improves upon stopping down. As we’re used to seeing in zooms, even high-grade models, this one is slightly less sharp at the longer focal lengths. Chromatic aberration is well controlled particularly from 35mm onwards though inevitably there’s some at 24mm in the corners but the A7 twins have built-in compensation tables for that. Perhaps that’s just as well as without it distortion may be noticeable (barrel at the shorter end and pincushion from around 30mm upwards). Vignetting is quite heavy too throughout the zoom range, as it expected on a camera with a short register (flange focal distance) though it’s more obvious at the shorter focal lengths. And, finally transmission is a little lower than we expected at 4.6TStop, though to be fair it’s consistent throughout the range. Against the two prime lenses launched alongside the A7 and A7r, the Vario Tessar still looks good but it’s less sharp than either by quite a margin when compared at their respective focal lengths, though that’s part of the price you pay for the convenience of a zoom. Distortion is higher of course, but vignetting is quite high with all three though technically the zoom has less vignetting at the two respective focal lengths. Bare in mind though it has worse vignetting than the two primes at 24mm where the fall-off is more rapid and just over -2.5Ev in the corners. The same can be said for lateral chromatic aberration – it’s very well controlled from 35mm and onwards but it’s quite heavy in the extreme corners at 24mm at each aperture setting. 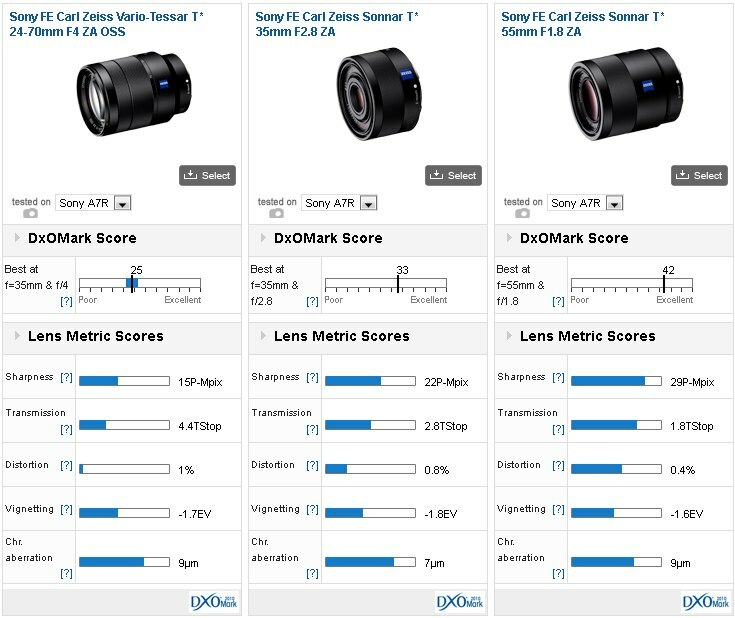 Both the 35mm and the 55mm particularly have much higher acutance than the Vario-Tessar at their respective focal lengths. However the zoom has very consistent sharpness across the frame. The Sony A7 system doesn’t just exist in a vacuum of course it still has to compete against traditional optical viewfinder equipped DSLRs. Compared to the recently revised $1,300 Nikon AF-S VR Zoom-Nikkor 24-120mm f4G ED the Zeiss fares quite well, but peak sharpness looks a little low when compared with the stabilized Canon EF 24-70mm f4L IS USM. That’s just peak sharpness though, at most focal lengths and aperture settings the Zeiss is sharper across the image field, but with no AA filter the results are somewhat biased in favor of the Sony A7. 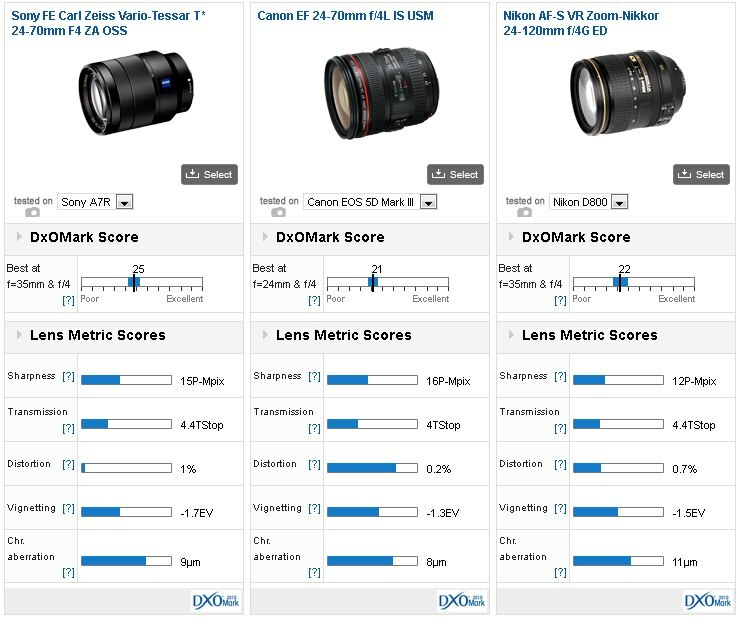 It’s worth keeping in mind that the Canon lens is $300 more expensive than the Zeiss and that Canon combination has slightly higher peak sharpness from a 22-Mpix sensor, and one that’s equipped with an AA filter. 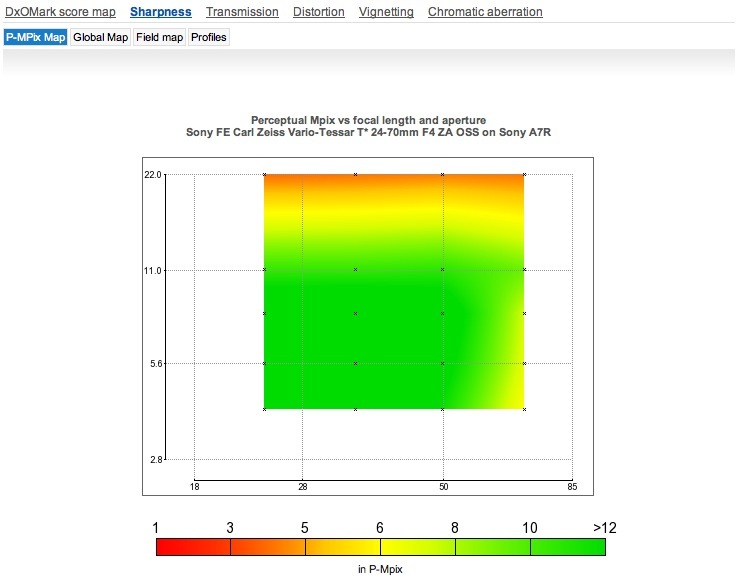 Although we can’t say for sure, it’s likely peak sharpness would be considerably higher with a similar sensor. In all other respects the Zeiss performs similarly to the Nikkor, despite that model’s greater zoom range, but it is surpassed in some areas by the Canon. 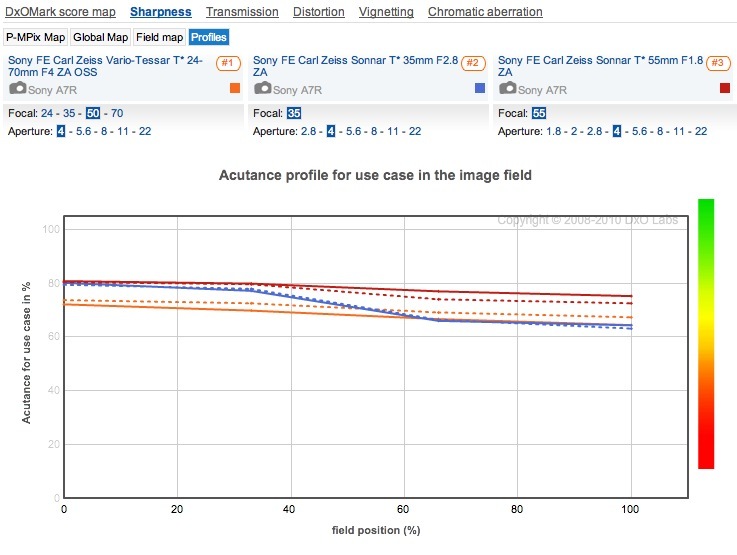 For a start the Zeiss has lower transmission and higher distortion. It also has slightly heavier vignetting in the corners and more lateral chromatic aberration – at least at the wider end. At the longer focal lengths, the Zeiss has better control than the Canon. Performance of the Zeiss Vario-Tessar is good overall but it’s not without some idiosyncrasies. On the one hand it has very good uniformity, barring a dip wide-open at 24mm, it’s sharp right out to the corners. Control of other aberrations at the wide end – chromatic aberration, distortion and vignetting isn’t quite what we would expect, but at all other focal lengths the lens performs well. Given the not unreasonable price of the lens (and the camera body for that matter), Sony has managed to deliver a balance of performance and value, while at the same time offering something different to the mainstream options. There’s little doubt it’s an attractive combination, but it’s not quite the resounding success we believed it would be.